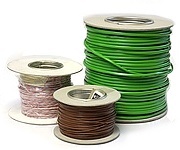 Type K Thermocouple Compensating Cable for connecting thermocouples to instruments etc. Two 7/0.2 size conductors, with PVC insulated inner sheath and PVC insulated outer sheath. Class 2 thermocouple connecting cable tolerance. IEC colour coded (green outer & postive, white negative).